MANILA, Philippines - Online job site Jobstreet has released recently their 2015 salary report which focused on top specializations or high-paying jobs in the Philippines this year. The report reveals that IT – Software and IT – Network, System, and Database Administration are the best paid, consistently occupying the top two spots across all position levels (1 to 4 years’ experience, 5 years and up, and assistant manager/manager). The only other job specialization that is placed in the top 10 for all position levels is Customer Service. Meanwhile, Electrical and Communications Engineering, Sales/Telesales, and Training and Development are placed in two of the three position levels. The company said the the shift of focus from the top industries reported last year to top jobs as the latter could have more impact for job-seekers. After all, the first thing Filipinos consider when looking for a job is the fit between the available opportunity to their field of study, skills, and interests. Thus, having information on how much one’s skills and specialization get paid in the job market would prove more useful in certain situations. Junior employees specializing in IT/computer-software are the highest paid, followed by those specializing in network/system/database administration. Junior lawyers place third with average earnings of P27,033. Employees with 1 to 4 years of experience specializing in actuarial sciences/statistics and electronic and communications engineering round up the top 5. Supervisors specializing in IT/computer-software, IT/network/system/database administration, law/legal services, and electronic and communications engineering placed first to fourth in the highest paid list in their level. Employees specializing in customer care get a noticeably high salary upgrade, as customer service supervisors placed fifth on the list. Sales and telesales specialists up to the supervisory level still managed to secure a place in the top 10, though other specializations would later surpass them in the managerial level. Even in the managerial levels, IT specialists still occupied the top 2 positions, cementing their position as the highest paid professionals in 2015. 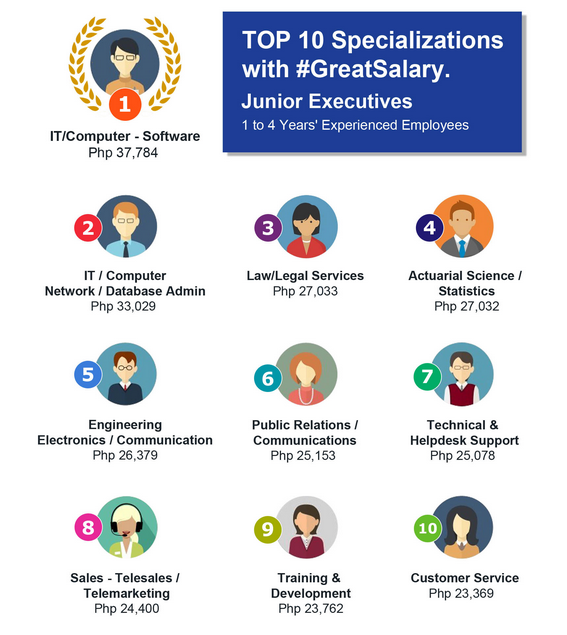 Technical and helpdesk support managers also enjoy a great salary, with an P80,405 average. Customer service managers also get paid better, making them the 4th best-paid managers according to specialization. While they were absent in the supervisors’ report, training and development specialists ranked 6th, with its managers earning an average of P67,380. It is interesting to note that architects and interior design professionals are the 5th best paid managers.